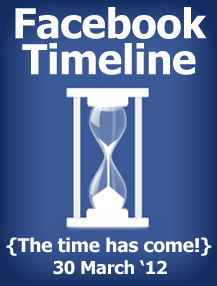 Facebook Timeline for Brands comes into effect 30 March 2012! Attention all Facebook Fan and Brand page owners and admins: the time has run out for the old Facebook layout that we’ve all come to know and love! Ready or not, the new and improved timeline for brand pages comes into effect today, 30 March 2012. This is great news for anyone with a Fan or Brand page actually, as the timeline (among other improvements) makes the interaction between fan and brand/company much more personal. Get ready to tell your brand or product’s story, and showcase your business. Among the bundle of changes Facebook has made, the highlight for us is the ability to engage with fans through private messages directly from the new (and vastly improved!) admin panel on page. The entire layout and design principle makes for a great user experience and ease of use from a page administrator’s perspective. Good luck with the transition, and give us a shout if you’d like any help!